Posted on June 28, 2013 by Susan H.
When you think of Canada…what comes to mind? For many Canadian foodies…the answer would be Butter Tarts. 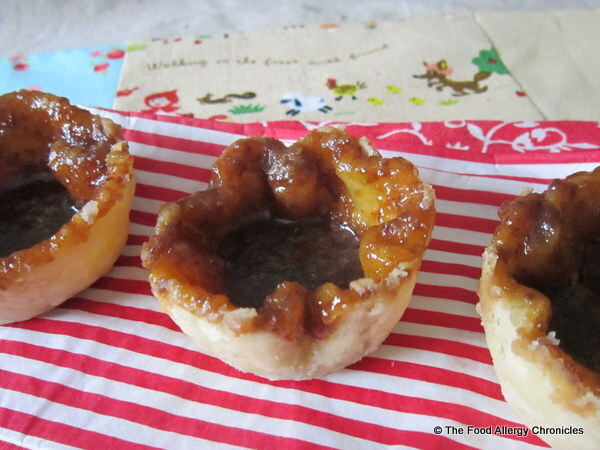 Butter Tarts…the quintessential Canadian bakery treat. My first memories of Butter Tarts date back to when my Grandmother visited from England…my mother always had a box of Butter Tarts specifically for her mother…well, she did share them. Grandma loved her Butter Tarts…as did I! Unfortunately, I have not been able to share my love for Butter Tarts with my boys. 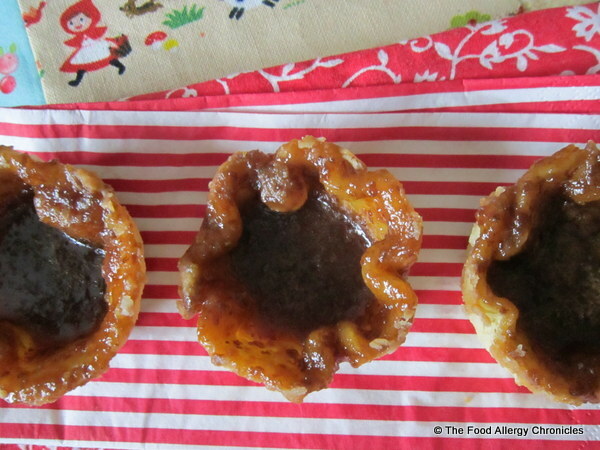 For years, my boys have watched family members enjoying the simple pleasure of devouring the sweet and sticky tarts…dairy, eggs and the possibility of peanut/tree nuts make Butter Tarts . So you can imagine my boys delight when I was able to re-create the famous Butter Tart to be dairy, egg and peanut/tree nut free for them to enjoy. I am still trying to perfect this recipe with the right cooking time and amount of filling. My advice is to ere on the lighter side for the filling than to fill them too full. Refrigerating the pastry lined muffin tin before baking does make a difference on how much the filling overflows. Take the time to do that step. In a bowl, mix together the above ingredients. In a large bowl measure the flour and salt together. Combine the oil and water in measuring cup. Using a wooden spoon, carefully fold together the wet with the dry until just combined. Roll each dough ball out between floured wax paper until about 3 mm thick and cut 4 inch circles and tuck into muffin tins. Fill all 12. Fill each pastry lined muffin tin with less than a 1/4 cup of the filling. Bake at 325 F for 20-25 minutes watching carefully that they do not overflow…which mine did. Carefully lift the tarts out of the muffin tin to finish cooling on a cooling rack. They may not have looked pretty but my boys loved them! 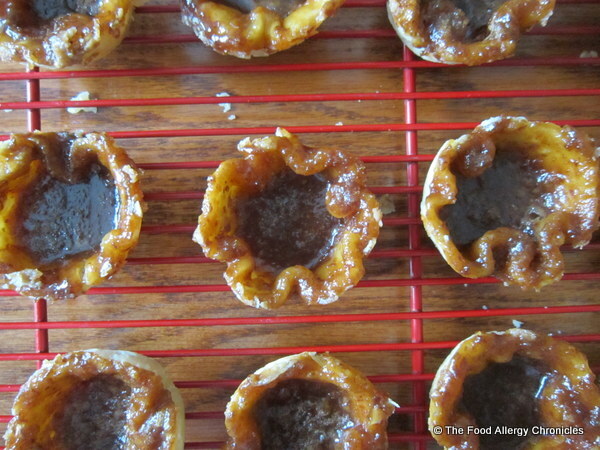 This entry was posted in allergies, baking, Canada Day, dairy free, dessert, egg free, multiple food allergies, peanut/tree nut free, soy free, Tarts and tagged dairy, egg, Soy and Peanut/Tree Nut Free Butter Tarts by Susan H.. Bookmark the permalink. Wow your always baking!! They look delicious! Have a great Canada’s day weekend! What a wonderful resource! My 23 year old daughter has multiple serious food allergies (peanut, tree nut, sesame, all fish…unfortunately the list goes on). I would have loved the support your blog has to offer as we found our way around all the pitfalls as she was growing up. The good news is that she is now a happy and healthy adult working and living in Kyoto, Japan. We never thought it possible as she is allergic to most of the core foods used in Japanese cooking. Where there’s a will there’s a way! She was determined to live her dream. Fortunately she is a real foodie and loves to cook so she recreates Japanese and Korean meals for herself. She has her own blog which she uses to share her food adventures. Just thought you would be interested in hearing from a mom whose a little further down the road! Thank you for sharing your recipes and ideas! Oh my!! I am sooooo excited about these! Never in my wildest dreams did I think i’d ever be able to eat a “butter tart” again! eek!! These are going on my list! Thank-you Susan! !